If it had not been for Wheat, human beings may never have socially and culturally developed as cosmopolitan as we have. Wheat was the first crop to be cultivated on a grand scale and stored long-term, enabling the start of city-based societies and the dawning of civilization. 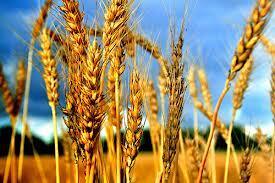 Wheat is a cereal grass, but before cultivation it was a wild grass. Wheat is believed to have originated in southwestern Asia. Archeological research indicates that Wheat was grown as a crop in the Nile Valley about 5,000 BC. Wheat is not native to the U.S. and was first grown here in 1602 near the Massachusetts coast. When Wheat is traded as a commodity, it must be classified into very specific classes according to grain properties established by the exchange. The Chicago Wheat contract is also known as Soft Red Winter Wheat. Its name is derived from the fact that the crop is grown during the U.S. winter months. Soft Red Winter Wheat is grown in the South, the Great Lakes region and east to the Atlantic, all of which are more humid environments than other wheat producing regions. The planting season is from mid-August through the end of October. The crop heads in May, and the harvest occurs at the end of May through August. Soft Red Winter Wheat is used to produce flour, the key ingredient for breads, pasta, crackers and many other food products, as well as several industrial products such as starches and adhesives. Chicago Wheat futures provide a way to effectively manage the global price risk that Wheat merchandisers, producers, food processors, livestock operations, importers and others have related to the purchase or sale of Wheat. Futures contracts provide opportunities to identify short and long-term cyclical price and volatility patterns. Chicago Wheat futures traders are able to take advantage of arbitrage and spread opportunities with other commodities, including related grains, oilseeds and livestock. The Chicago Wheat contract trades at the Chicago Board of Trade (CBOT), part of the CME Group. The electronic futures contract trades on Globex from 7:00 PM CT to 7:45 AM Sunday through Friday. As well as the primary hours of 8:30 AM CT to 1:20 PM Monday through Friday. One Chicago Wheat futures contract is 5,000 bushels, or approximately 136 metric tons. The previous settlement price (July 23, 2013) for December 2013 Chicago Wheat futures was 665’4, or $33,275 per contract. The most common contract symbol is ZW. The performance bond or initial margin requirement to initiate one futures contract position is $1,925 (as of November 11, 2015). To control that futures position going forward the maintenance margin becomes $1,750 (as of November 11, 2015). One futures contract price increment or “tick” is ¼ cents per bushel. A one “tick” move is $12.50. The next tick after 665’4 downward is 665’2 followed by 665’0. Therefore, a one-cent move, from 665’0 to 664’0, is $50. 665’4 reads as six dollars and sixty-five and a half cents. The Daily Price limit is currently $.35 per bushel expandable to $.55 when the market closes at limit bid or limit offer. For example, if the market closes at limit offer, or 605’4, on Wednesday, July 24, 2013, the next session’s Daily Price Limit would increase to $.55. If the following trading session fails to close at limit offer, the next session’s Daily Price Limit reverts to the $.35 limit. The exchange resets daily limits for Wheat in May and November of each year, based on a percentage of the average settlement price of benchmark contracts during a roughly nine-week observation period. The futures contract month listings are March (H), May (K), July (N), September (U), and December (Z). “New crop” refers to the July futures contract as that is the month in which Chicago Wheat in the ground is harvested. “Old crop” refers to the tradable contracts covering last year’s crop. The futures contract’s Last Trading Day (LTD) is the business day prior to the 15th calendar day of the contract month. The December 2013 Chicago Wheat futures contract LTD is December 13, 2013 for example. The First Notice Day (FND) for that same contract is November 29, 2012. Significant fundamental reports to be aware of are the United States Department of Agriculture (USDA) Crop Progress reports, typically released at 3:00 PM CT on Mondays, and the periodic Crop Production and USDA Supply/Demand reports, typically released at 11:00 AM CT. This particular market has the potential for volatile and large trading ranges due to fundamental factors. Visit https://www.danielstrading.com/ for additional contract specifications and market information regarding the Chicago Wheat futures market. Don C. DeBartolo is a Series 3 licensed broker registered with the National Futures Association (NFA). As a former arbitrage clerk in the S&P 500 futures pit at the Chicago Mercantile Exchange (CME), Don has floor trading experience. Taking his trade execution expertise and ability to navigate a fast-paced environment, Don transitioned to the brokerage side of the business. Since 2005, he has worked at Daniels Trading, a brokerage firm in the heart of the financial district in Chicago. His responsibilities as a broker include providing market analysis, trade execution, and money management to his clients around the world. In March 2010, he developed a formal trade advisory for clients of the firm seeking specific trade recommendations and subsequent risk management. Due to his widespread proficiency and experience with the futures and commodity options markets, he is able to offer his clients timely insight, specialized trade recommendations, and educational information through various videos and writings. Studying at Loyola University Chicago, Don discovered the international sport of rugby. Still today, he plays for the Chicago Griffins, a member of the highest league of rugby competition in the United States. Skill and discipline are two traits that carry over from the pitch to the trading screens.